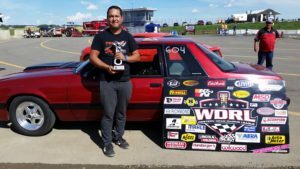 WDRL Small Tire Series, August 14, 2016. Central Alberta Raceways, Rimbey Alberta. 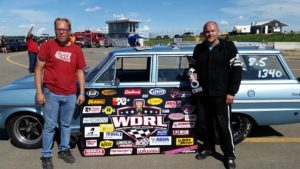 One of the better turnouts for the WDRL Small Tire Series was in Rimbey Alberta this last weekend. Saturday was a private no prep grudge race that brought a lot of cars from all over Western Canada. Many stayed for the WDRL race on the Sunday. Outlaw 8.5 Champion and current points leader, Mark Campbell was on hand, but did not have the day planned. 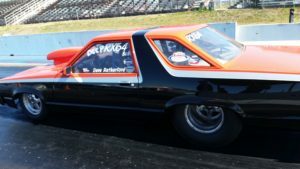 Ryan Hoskins in his sharp Chevy II wagon, was on fire and took the field in OL 8.5. Extreme Street had some newcomers to the program and with a unfortunate accident with Myron Felzien’s Ford T Bird in the quarter final, crashing heavily into the wall after the 1/8 mile finish line after winning his race, when his chutes deployed and got caught in the wheelie bars, upsetting the car under braking, sending it to the right hand wall. The car was heavily damaged but Myron was fine and looks to rebuild the car. Raiden Higa had the semi final a bye run and then the final as a bye run since Felzien could not make the call. Open Comp was a great race between Dan Bold in his “street” Chevy truck against points leader Dave Rutherford in his Ford Fairmont. Rutherford took the win and extended his points lead. WDRL Small Tires Series next race will be the double header, double point final event of the season at Castrol Raceway on September 3-4, 2016.